After tons of long hard work we are proud to share the new Aurora Borealis cd Timeline: The Beginning and End Of Everything. The CD is available as a free download Courtesy of Aurora Borealis. They are 256kb mp3's and full high res art / layout. It has a 12 page full color booklet with artwork by Ron Miller (production designer for the movie Dune) There will only be one pressing. "Timeline: The Beginning And End Of Everything", which was produced by the band's guitarist/vocalist Ron Vento, marks the recording debut of drummer Mark Green. It consists of nine tracks and two narratives. The album is a conceptual effort that starts from the beginning of all existence and continues through until the very end of universe and the eventual retraction and rebirth of it all. Hey, yes it is, he played on the First MCD Mansions oF Eternity and The the one right before the new one Relinquish. Yeah He is just a sick drummer. One of the best. If you have a news section Maybe you could share this news. If interested in interviews etc feel free to get back in touch. Here is a video going over the gear that was used to make the new Aurora Borealis cd as well as some playing and song clips from the new cd as well as cover art. This will mark Aurora Borealis 7th cd. Spanning 17 years and still going strong. It was recorded at Nightsky Studios http://www.nightskystudios.org and produced mixed and mastered by Ron Vento. The line up is Ron Vento Guitars Vocals and programming, Mark Green on Drums and Jason Ian-Vaughn Eckert on bass. We are expecting a late an early 2014 release. 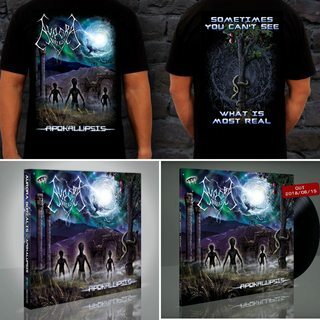 The entire discography is still available for free download at http://www.auroraborealis.org for a limited time. Contact aurora4dth@aol.com for pre orders of the cd etc. The new album "World Shapers" is basically an offshoot from the other cd "Timeline". There is a line on "Timeline" in the song "Tearing Holes in the Fabric of Time" that talks about the human race sending encoded dna/human genome Micro organisms in a message that they send while using plank energy to tear open the fabric of time itself into other dimensions, billlions of times. They do this because our universe is dying along with everything in it. The line even says that this is a different story (thus not part of Timeline but to be address later). This story is about the reception of that message by a different species / race in another dimension. It was planned to do this story long ago when writing the "Timeline" cd. While "Timeline" was more what i believe to be truth about the Universe, it's birth and demise and everything in between, this new cd is purely Science Fiction but still touches on some very real topics. To sum it all up Our last messages were received and we were then reconstructed using our own notes and dna, as well as the human connectome project on a planet terraformed specifically for humans to live on. The new race removes some of us for experimentation as well. They monitor our progress over thousands of years, and decide along the way we are not worthy to really live. We as a species should not be allowed to exist anywhere in the universe due to our ways. We also confuse these creators as our gods. Eventually they decide to eliminate us, but not with traditional war methods, they are ancient beings they do not have WAR like we do so they use other methods. The irony is they are no better than us and they are also being watched and will also will be judged. The story sounds rather simple but lyrically it gets pretty in depth. As usual i add some many subtle subliminal messages hidden within so even though it is science fiction there things to be learned . I'm all for an epic-length description of a concept, especially a Sci-Fi or Fantasy one, but what do you actually sound like? Ah, cheers, Mo. The kind of thing I probably would have been more interested in in the late 90's, I think. Painkiller, If you go to the end of the video i posted you can hear some clips from the new cd. The other video that was posted was from 4 albums ago when we had no money to record a quality sounding cd. Same vein though so you prob still may not like it, But thanx for checking it out. Hedonism Yeah I like it too for sure. I just wish it sounded better hahah. I think from the cd Relinquish and on we started to make better sounding cds. The first ones were so raw sounding. This will mark Aurora Borealis 7th cd. Spanning 17 years and still going strong. It was recorded at Nightsky Studios www.nightskystudios.org and produced mixed and mastered by Ron Vento. The line up is Ron Vento Guitars Vocals and programming, Mark Green on Drums and Jason Ian-Vaughn Eckert on bass. We are expecting a late an early 2014 release. The entire discography is still available for free download at www.auroraborealis.org for a limited time. The new album "World Shapers" is basically an offshoot from the other cd "Timeline". There is a line on "Timeline" in the song "Tearing Holes in the Fabric of Time" that talks about the human race sending encoded dna/human genome Micro organisms in a message that they send while using plank energy to tear open the fabric of time itself into other dimensions, billlions of times. They do this because our universe is dying along with everything in it. The line even says that this is a different story (thus not part of Timeline but to be address later). This story is about the reception of that message by a different species / race in another dimension. It was planned to do this story long ago when writing the "Timeline" cd. While "Timeline" was more what i believe to be truth about the Universe, it's birth and demise and everything in between, this new cd is purely Science Fiction but still touches on some very real topics. To sum it all up Our last messages were received and we were then reconstructed using our own notes and dna, as well as the human connectome project on a planet terraformed specifically for humans to live on. The new race removes some of us for experimentation as well. They monitor our progress over thousands of years, and decide along the way we are not worthy to really live. We as a species should not be allowed to exist anywhere in the universe due to our ways. We also confuse these creators as our gods. Eventually they decide to eliminate us, but not with traditional war methods, they are ancient beings they do not have war like we do so they use other methods. The irony is they are no better than us and they are also being watched and will also will be judged. The story sounds rather simple but lyrically it gets pretty in depth. Please specify EXACTLY what you are ordering and put name and address in order. Every thing i am listed is being printed in limited addition quantities according to the label. and put name and address in order.